Sonic the Hedgehog, as played as Phil Collins. Sonic the Hedgehog is a name dragged through the mud over and over again. Bluey the Porcupine is synonymous with awful framerates, buggy physics, and poor coding. For many years, the name was dirt, even though the games themselves were at least somewhat enjoyable. But the most turdly Sonic games are always the result of a team being rushed and forced to work within the confines of lacking engines or tight deadlines. 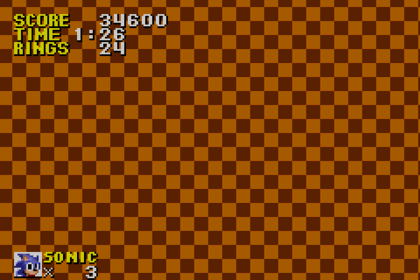 Enter Sonic the Hedgehog Genesis. 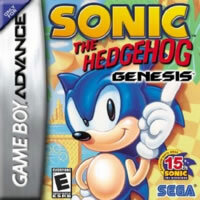 Because it wasn't enough to ask that the original Sonic the Hedgehog game be ported to the Game Boy Advance in a very small timeframe, but also that it be done off the bones of the existing Sonic Advance engine, which in itself was designed for small sprites and well-managed art assets. The engine was NOT designed to use massive sprites that clog up all the memory and cause the game to chug along like Thomas the Tank Engine after he's fit to burst. The whole presentation is off. Take any one screenshot from this game and look at it, and you'll see practically nothing wrong. Yes, the HUD is a bit small and the action looks a bit too zoomed in, but there doesn't appear to be anything inherently bad happening. But when you see the game in action, it becomes immediately obvious that the Game Boy Advance can barely muster enough juice to run this game at anything more than a crawl. The sprites flicker and parts disappear entirely, the action grinds to a halt, and the music gets out of sync very quickly. Or slowly, rather! Or the gameplay is slow, but the music is full speed! That's it! Because when you're in the Labyrinth Zone and Sonic is drowning from a lack of air, the drowning theme shouldn't have enough time to loop over and start again — but somehow, it does! Because while the game feels like some primitive J2ME mobile phone game from the early 2000s, the music is running full speed wondering when the game will catch up. Unresponsive! Sonic games should never feel unresponsive, but it takes what feels like a year for the button you press to register to an action in-game. It's much harder to judge the pressure-sensitive jumping for how long the button is held down, and because the physics are butchered, you're unable to pull off the same excellent stunts, time-savers, and impressive feats that are possible on any other version of the game. There's a Spindash, which was remarkable when Sonic Jam had it. Along with Sonic 2, 3, Knuckles & Blue Spheres, plus difficulty modes and time trials. And yet, Genesis is meant to be a celebration of the Sonic the Hedgehog series? Yet all it has is the Spindash?! I mentioned the music runs full speed, but what does it sound like? It sounds like a mess! The instruments are off-model! 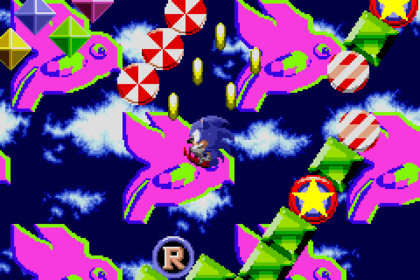 The Game Boy Advance is capable of making that Genesis-style raw electric guitar-sounding synth with enough tinkering, so why can't Sonic Genesis do it? Oh yeah, because it's been built off Sonic Advance rather than ported directly! Yuji Naka must be spinning in his luxury satin sheets. For a port made to commemorate Sonic the Hedgehog's history and as a celebration of his roots, Sonic the Hedgehog Genesis digs the grave deeper. As a person capable of enjoying most Sonic the Hedgehog games for at least one element of the package, Genesis has NO redeeming features. SEGA said that porting a Genesis game to the GBA was bound to present some difficulties, yet they managed to port over Comix Zone with little difficulty. Soon after this abomination disgraced shelves, a hacker named STEALTH ported Green Hill Zone to the GBA in it's entirety. What is he doing now? Oh yeah, working on Sonic Mania. At least they learned their lesson: get someone competent.